News Release: WASHINGTON – The U.S. Department of Agriculture today announced the projects selected to receive the USDA’s annual farm to school grants designed to increase the amount of local foods served in schools. Sixty-five projects were chosen nationwide. Slated for Saturday, May 20, 2017 the ‘Future of Food – Urban Farming Field Trip’ will visit a series of innovative urban farming ventures in Inland Southern California that have emerged to grow the local food marketplace, increase food access, educate local communities, advocate for food equity, and improve health and nutrition. 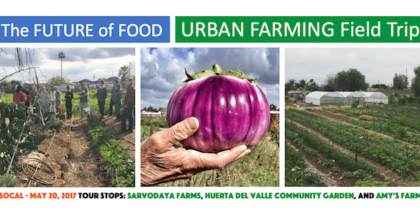 The field trip hosted by Seedstock, a social venture that seeks to foster the development of sustainable local food systems, will also include lectures from experts in urban farming. If you’re going to be in the Los Angeles area on April 7, 2017, please join Robert Puro of Seedstock in a discussion of “The Future on Your Plate” as part of the First Fridays series at the Natural History Museum of Los Angeles.